While plants are beginning to spring forth from the earth and bloom outdoors, our thoughts turn to our cacti and succulents. They are beginning to emerge from their cool winter slumber. They tell us this by the lighter shade of green at the tips, signaling new growth. Some of us in the club overwinter our cacti in a cool place, without water from November until April. Some members have greenhouses for this purpose, one of our members creates hoop houses with plastic over old futon racks to create a functional greenhouse. Small heaters maintain temperatures around 40-45 degrees F. While plants rest we keep an eye out for mealy bugs, spider mites, and scale which might take advantage of our reduced vigilance this time of year. Those who grow winter growers are enjoying the flowers and new growth of their plants. Another of our favorite pastimes for this early growth period is to start some seeds. Under lights, on heat mats or not, the seeds sprout quickly – although some species like to keep us waiting for up to several months. Gasteria are fun – always prompt in sprouting and growing into something resembling a tiny Gasteria quickly. Beaucarnia recurvata is quick to sprout and grows into two inch tall plants in a couple of months. 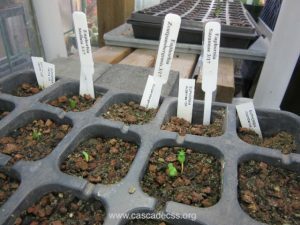 Some members grow seeds according to the plant’s origin – with the South African winter growers being seeded in October and November. Some of us start all sorts of seeds in January and February. Growing from seed takes focus with keeping seeds moist, keeping seedlings moist, and the air moving. And eventually all the potting up. 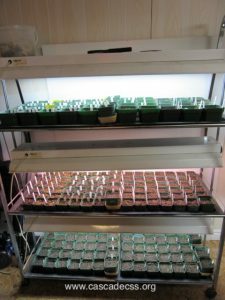 We have discovered that the seedlings generally prefer crowding and keep them in the crowded pots they were seeded into for 2-3 years before potting up. If potted up very tiny they languish and fade quickly. The problem with all this growing from seed is that it’s easy to throw 30 seeds into a pot, but when we get to the potting up stage space becomes more of an issue. And while we wait for them to get to selling size, we need to add another shelf somewhere to hold them all. And, oh yeah, a couple of lights are needed, too. Growing from seed is a slippery slope. Spring is about promise and hope. As cactus and succulent enthusiasts in the Northwest we are all about that. Today it has rained, snowed and they say hail is on the way. Happy Spring everyone!